Lady CoMo's rear wheel cleared customs last week. The plan, which had been to get to the cottage early on Friday to meet Mary, was adjusted. 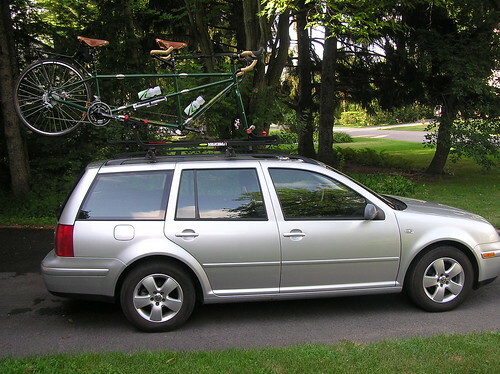 I went down to Bertrand's late in the day for a fitting, put her on the new roof rack and drove off into the sunset. Saturday morning we suited up for our maiden voyage. "Should we walk or ride to the highway?" asked Mary. It's a two-and-a-half kilometer jaunt. We elected to try riding it. Within half a pedal stroke we were rolling on the grass, laughing our heads off. So much for riding. Our humour faded when we hit the highway. It was three minutes before we could even cross to the opposite side. On the Saturday morning of a long weekend (aka bank holiday) traffic was severe. You could have cut the tension in both us with a knife as we managed a wobbling start that stayed within the margin of the paved shoulder – barely. Mary was pedaling furiously, knowing that I like a fast cadence; I was pedaling slowly knowing Mary likes it slow. We both were steering, we both were trying to see the road ahead, we both were spooked by the holiday traffic careening past us. The bike wobbled, the pedals jerked in fits and starts. We stopped less than a kilometer up the road and walked back to the cottage. It was a lovely morning for a walk. The week passed. Last Friday we walked over to a nice, large, empty parking lot to practice. Start. Stop. Start. Stop. Start. Coast. Stop. Start. Coast. Turn Left. Coast. Turn Right. Etc. "This is just like dance lessons," said Mary. Not a good sign – we tried dance lessons twice and will never do so again. On Saturday we put her on the car top and drove to the Agricultural Experimental Farm in the centre of Ottawa. The roads were closed to traffic and there's a nice loop of about 2 km, including a small rise that pretends to be a hill. Riding in a circle has its advantages – you never have to stop. Today we rode directly from home for the first time. It was early morning, traffic was light. We rode past the Farm and down to the river, looped along under the Parliament Buildings, up the Woodroffe bike path, across the Farm, and back home. 45 km total, with stops, starts, bumps, and one real hill that was a piece of cake. We were still talking to each other civilly at the return. I think we're on a roll. Posted by Kern on August 7th, 2011. In your second photograph it looks as if the whole bike didn't quite manage to clear the roof of your car. One of those 'odd box' style images. It does look a very good bike. May the roll continue. I suppose the question is: (after the completion of your first tour) does Mary enjoy being at the back? That looks a cracking tandem, with the promise of many good times ahead. LOL: Mary being at the back. Well, yes and no. Mary professes to be a chicken when it comes to cycling, but I don't agree. She lacks self-confidence in her cycling abilities, but anyone who willingly cycled the mountains of Romania has a lot of guts. The biggest issue we have to contend with is a left-handed vs right-handed type of thing. We lead with opposite feet, stop on opposite sides, coast with opposite feet, etc. No matter which we ride, it's not natural for one of us. That's why it took some practice just to get started. The biggest issue ... We lead with opposite feet ... coast with opposite feet. You could try refitting one set of cranks (turned by 180 degrees) to see if this reduces the conflict. Perhaps you can then stop on opposite sides as well. 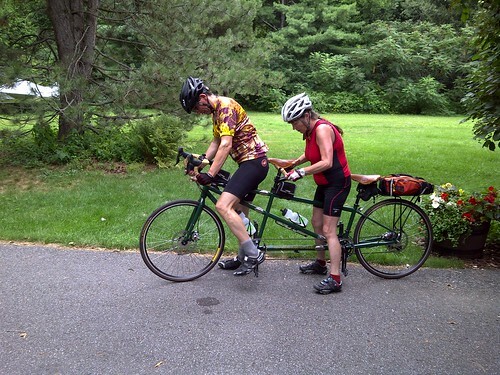 I've also read that when setting off or stopping a tandem it helps to stabilise the bike if the one behind puts their hand(s) in the middle of the front one's back – I can't imagine how this works but apparently it does. 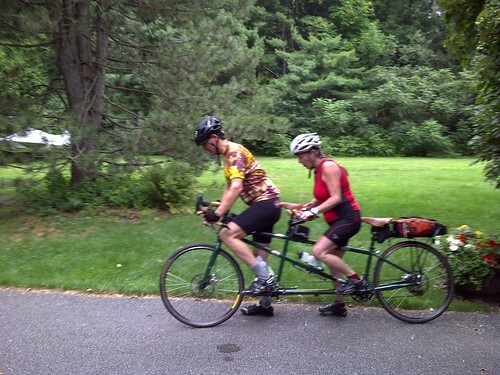 My wife has broken her arm so when we were offered the loan of a tandem that was up for sale we decided to give it a go. Your experiences totally match ours almost exactly. We had a ride on a nice wide cycle path and had such a laugh, even when due to her being a lefty she had me over the handlebars looking at the front wheel instead of sitting down. The same as you when we took the bike out on the road it was not as good. Coasting has to be sorted out as when I say coast Jill locks the pedals with the right one down. We are still learning about letting me position the pedals for bends and turning them to change gear. Jill tends to stamp on the pedals and I spin so we are both trying to compensate for the other, until we get to a hill (In North Wales at the moment so hills are around) then we both seem to click and we fly up them. Also on the flat road if we work we take off like the clappers. But normally we wobble about as you did. We are out again today so it will either be fantastic or abject disagreement. Thanks to you I have been reminded to relax and and have fun. After all it is only like riding a bike. Hi Keith. I'm glad to hear we're not the only ones with a learning curve :). I know what you mean about trying to compensate for each other – it is surprising how disconcerting a jerky pedal motion can be. We made it out for a 50km run yesterday at the cottage – highway with rolling hills all the way. Apparently at one point we were cruising at over 50kph on the flat. Mary didn't tell me this until we were stopped (she has the computer on her handlebar), which is a pretty strong indication of how safe the bike feels. I'm sure your learning experience will be as good as ours. By the way, I hope Jill's arm is on the mend. "No broken bones" is a big motto in our house. Thanks Kern unfortunately she does not act her age playing football. I can totally understand about the pedaling. If I say coast we have worked out that the next time the right pedal is down we stop pedaling, unfortunately Jill the locks the pedals solid really solid. If I need to rotate the cranks to change gear when coming to a stop I can not. So yesterday I got her to practice just relaxing and letting me pedal just letting her legs go around. This worked well. Unfortunately this is yet another word for us to use and remember in the communication business. We went out for a ride yesterday with our son and he said it is like a running commentary even discussing if I should change up or down. The absolute best part was that without really trying we could for the first time in years make the fit young thing work and even left him. Oh how smug we were about that. By the way, Keith, are you both wearing clips? We were and are using Shimano cleat-ed pedals and shoes. Jill has to mount the bike and clip in while I hold it up, then I clip my right foot in and we set of when I say go. We tried to start of the way you are in the picture but as she can only hold on with one hand this causes a lot of merriment wobbling and general loss of control as I am not heavy enough to counter such movement. I hate the idea of us falling over and her breaking her arm again or even worse the other one. I would never here the end of it and it is bad enough with one companion called clunk let alone 2. 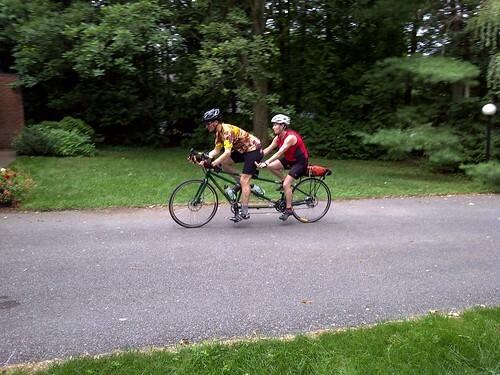 There's a photo here of a tandem with the cranks out-of-phase (see tandem bicycle article on Wikipedia). There doesn't seem to be any reason why the front and rear cranks must be in the same position if the riders prefer them different. The cranks-out-of-phase would serve the same purpose as an egg-ring, would they not? I'm not sure sure if egg-rings have much practical purpose but I suppose cranks out-of-phase would spread the combined power of the pedallers over more of the revolution, but not to the same degree as the sets of cranks at 180 degrees to each other. I'm guessing Kern. I don't really know. Love your new Lady! Especially the green with tan leather work. It is great fun, but like yourselves its taking us a wee while to find a comfort zone. Things will get better tho. Im sure you will find a happy place with your new bike too. Thanks, Mary. I'm glad you like the British Racing Greeen – colour choice was the hardest decision. J.J. talked us into a Thud Buster seat post for the stoker, specifically for the pothole issue. So far it works like a charm – I've heard no complaints about the behind from behind :). 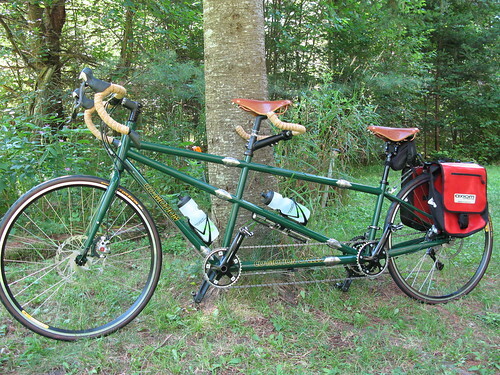 I've still only been round the block with a stoker on our tandem. But I've found the best way to get started is to ask my stoker not to pedal at all until I say so. The stoker should just rest their feet on the pedals, apply no pressure, until I am up to speed then pedal when we get going. I've only tried this method on the flat – and unladen – but it seems to work for me (us). Just a thought. ... it seems to work for me (us). Our experience is that whatever works is all that matters. Mary and I continue to work on our starting technique. We always start on her count ("Uno, dos, tres" and we're up) – it also helps with our Spanish 🙂 . 1. Starting crank position, e.g. 9 o'clock. This must be high enough to allow the captain to get off the pavement without bottoming out on the first downstroke. 2. Starting gear. This is the most important factor and the most tricky. Too low a gear results in bottoming out and instability, too high a gear and we don't move (or fall over). 4. Load. When fully loaded we need at least two extra gears. These days I stand if I have stranded us in too high a gear. This is always preferable to being in too low a gear.